18Pcs Gingerbread House Christmas Cookie Cutters Stainless Steel Biscuit Mold. Knit Silicone Fondant Mould Cakes Heart Rope Chain Sugarcraft Baking Icing Mold. 10/20 LED Photo Peg Clip LED Fairy String Light Wedding Hanging Picture Decor. This paste rolling pad is convenient for you to roll dough, pastry and cut apart cakes. Suit for oven, microwave, dining table. 1 Paste rolling pad. Material:Silicone. We are professional manufacturer to produce TV Wall Mount,Dog Harness,Dog Bed,Make Up Trolley,Mirrors,Garden Stand,Solar Led,Car Holder products and 3C Accessories. 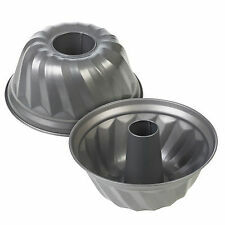 Ideal for making kugelhopf, bundt ring cakes etc. kugelhopf or. Made from steel with a non-stick coating, these tins feature the distinctive ring shape and will help you to produce your very own kugelhopf to show off at the next cake sale. A Must Have For Baking. 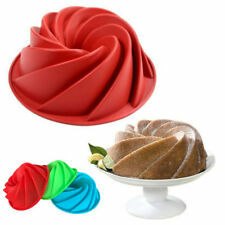 Round Silicone Cake Pan. 100% Food Grade Silicone. Microwave Safe. Brand new and high quality 24 Cavity Mini Muffin Cupcake Cup Silicone Mould Soap Cookies Bakeware Pan Tray. 12 cell adorable bunny rabbit butts chocolate mould - can also be used with sugarpaste, hard candy, resin, soap, wax, etc. The look particularly stunning when you pipe in their little tails in a contrasting colour. 3 Piece Non Stick Baking Roasting Cooking Trays. Set Oven Dish Bakeware Bake Pan. Suitable for use in all oven types. Fridge and freezer safe. 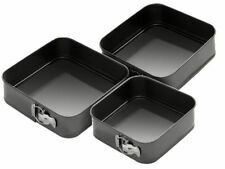 Mastronics Ltd. Mastronics 3 Piece New Non Stick Oven Baking Roasting Tin & Tray Set Dish Pan. The pan is made from high quality carbon steel and is coated in non-stick coating, this allows the even distribution of heat for perfect results. You will receive: 1 x 24 Cavity Mini Muffin Cup Bakeware Pan Tray Mould. ✔ Suitable for bread, cake, toast, ice, dessert, soap etc. Material: Silicone.